A large group of RSVP West volunteers knit a great variety of items for babies and children. A number of RSVP West local organisers, led by Judith Cains, help volunteers by providing materials, collecting completed items and helping to distribute them. Several knitters specialise in what are known as “trauma teddies” — teddy bears given to children who have suffered some calamity, such as a house fire or a road accident. Some are provided to local fire and ambulance brigades to comfort young children who have been caught up in serious incidents. The main emphasis at the moment is supplying hats, gloves, scarves, school jumpers, blankets and other items to various charities for distribution in disaster areas. 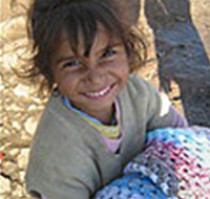 Among the groups are the Trussell Trust (a Christian Charity which supports orphanages in Bulgaria), Feed The Children (which helps children in need in countries such as Nigeria and Pakistan), and the Eleanor Children’s Charitable Trust (which sends shoeboxes of items to some of the poorer children in Romania). Blankets and baby clothes are also distributed to families in need through local agencies such as the Southside Project in Bath. This group provides specialist help to local families with seriously disorganised relationships or to individuals who are affected by the “ghosts” of their childhood, to strengthen their self-worth and independence. For more information, please email Judith Cains.